Happy Friday, readers! 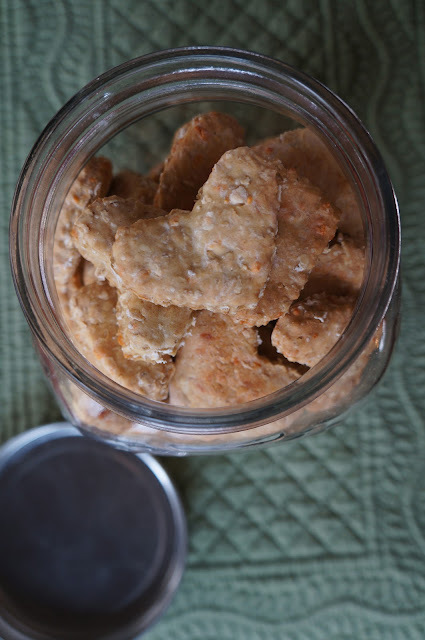 Sarah at Total Basset Case is featuring Fred & Tillie over on her blog today and in honor of the occasion, I figured I would share a quick and easy dog treat recipe so you can make snacks for your favorite pups from scratch. ...and then knead by hand until you have a ball. Chill for 30 minutes while you preheat your oven to 350 degrees. Put the treats onto a greased or nonstick cookie sheet and bake for 30 minutes. At this point, your kitchen will smell pretty tasty. Remember: these are for your dogs. Take out the treats and place on a rack to cool. Once your treats are cool, store them in an airtight container for up to a week. 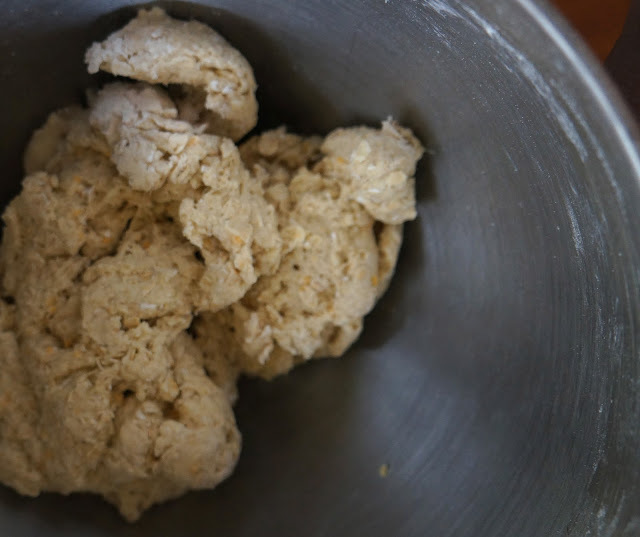 This recipe makes 48 treats, so you'll have plenty for your favorite dogs. Enjoy the weekend and stay hungry! Is it weird that these look good to me!? I may have to whip this up for Floyd this weekend, I think he will LOVE them. I also can't promise the husband won't taste test them! Thanks for hanging out with us today!! The house smelled divine... I am honestly shocked I didn't taste a few (especially since my version was vegetarian!). Let me know how it goes! I might just have to make these for my dog this weekend! Found your blog via Total Basset Case. Looking forward to reading more! Found you over at Total Basset Case! Your bassets are adorable!!! Our basset, Pierre, is a shelter dog too - he was set to be euthanized before we scooped him up. I get a big lump in my throat thinking about the what ifs...He is our first basset, but I'm not sure we'll ever own another breed :) Super excited to keep up with Fred and Tillie!!!! And I'm totally making these treats. haha. I'm with Sarah. They look pretty darn good to me! :) I think Sherman needs some of these for sure. Love it! Very cute! Dogs get overlooked on Valentine's Day! I'll have to make these for our little pup. My dog is obsessed with homemade treats. He does have a birthday coming up!! Thanks for sharing! I can always use another dog treat recipe! I may not be able to have cheese (lactose-intolerant), but my dog should still be able to! *stopping by via BowerPower blog link up. I love this- happy heart day to the poochies! We'd love for you link up on the photo friday blog hop- happy weekend! I made some today and there were some very happy pups at the dog park!! Thanks for the recipe!